The District Attorney at sentencing asked for and got a sentence of 40 years for his non violent burglary crimes. He asked for the long sentence because prisoners were eligible for parole after serving one fourth of their sentence and he wanted this man to serve ten years. 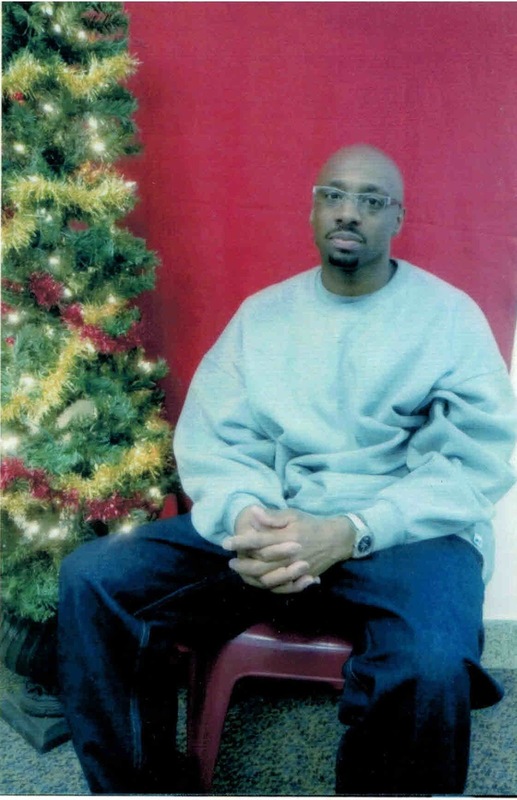 Here he is in prison 22 years later- that is in a nutshell the parole mess we are talking about. in an institution is necessary. The only thing that is going to change Mr.Johnson is time and putting him into his 30's and in this case 36 or 37 will at least give this community a break from his activities." “The total the state is asking for is 40 years. 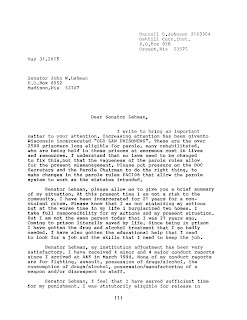 I'm asking that because quite frankly, given the conditions of our prisons and Mr.Johnson is probably going to serve about 10 years from today, roughly a little bit more, but I believe a 10 year period where he's in an institution is necessary"
Mr.Johnson has served almost 22 years and has been eligible for release since December 2003.He has seen the parole board 10 times and is continually denied parole and has been advised at every parole hearing that he has not served sufficient time for punishment. Darrell Johnson has completed all the programs required of him to do ,plus he also did extra programs. He has completed AODA Level 6 Therapeutic Treatment Program, an AODA Level 1 Support Group, gotten his HSED and received a Vocational Certificate in Custodial Services Lab. He has also completed 9 of the 10 Pre-Release ReEntry Modules. The last module can't be completed until he is within 6 months of his release. On his own, Mr.Johnson has completed Anger Management, Lift Truck Operator 2 Course and he is now a Certified Powered Industrial Fork Lift Operator. Finally, he has also completed all the necessary hours to obtain a Certificate of Apprenticeship as a Custodial Worker, through the Dept. of Workforce Development. “To whomever is reading this, please allow me, Darrell D.Johnson, to express why I feel that I deserve to be released. I will not claim to be a model prisoner but my institution adjustment has been very satisfactory. I have received 4 minor and 4 major conduct reports in almost 22 years. None of my conduct reports have been for fighting, assault, possession/ manufacturing of a weapon, the consumption of drugs/alcohol, possession of drugs/alcohol and/or disrespect to staff. I feel that I have served sufficient time for my punishment and more importantly, I am ready to be released and am statutory eligible for release, My program participation is very satisfactory. My parole plan is also very adequate. At this present time I know that I am not a risk to the public. At the worst time in my life 1 burglarized two homes. I am surely not minimizing my actions but I have done almost 22 years for a non-violent crime. I take full responsibility for my actions and my situation. But I can assure you that I am not the same person today, that I was almost 22 years ago. Coming to prison literally saved my life. Since being in prison I have gotten the drug and alcohol treatment that I so badly needed. I have also gotten the educational help that I need to get and keep a job. My plan is to start my own business in the custodial field. I also have a great number of family and friends that will assist me upon my release. I am truly and deeply remorseful for my actions. I also deeply regret doing what I did to get myself in this situation. I hurt a lot of people with the action that I took. I disappointed myself and my family I am truly thankful that no one got hurt during those two burglaries and that the victims received their property back. Thank you for reading about my situation. There are currently 4 signatures. We need 50 signatures! There is a lot in the statement of the DA at Darrell's Sentencing: “The total the state is asking for is 40 years. 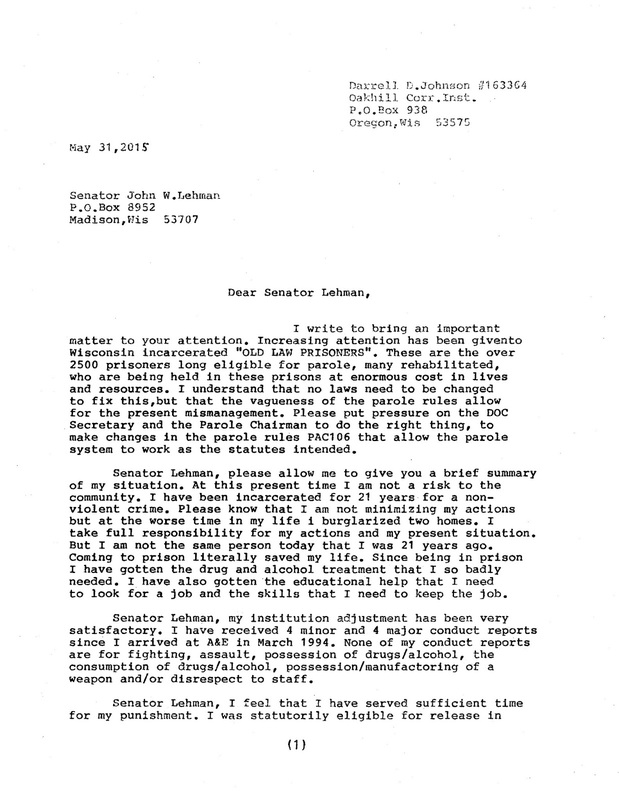 I'm asking that because quite frankly, given the conditions of our prisons and Mr.Johnson is probably going to serve about 10 years from today, roughly a little bit more, but I believe a 10 year period where he's in an institution is necessary"
SO the judge sentenced knowing that the offender would be out soon after he served 25% of his sentence, in this case 10 years. So he gave long sentences. This was before 2000 when everything changed. So why is Darrell still in after 22 years? he has done all he can to prove himself worthy of release. Please sign his petition and tell the powers that that you too, believe in rehabilitation and that Darrel Johnson deserves a second chance. · 4. 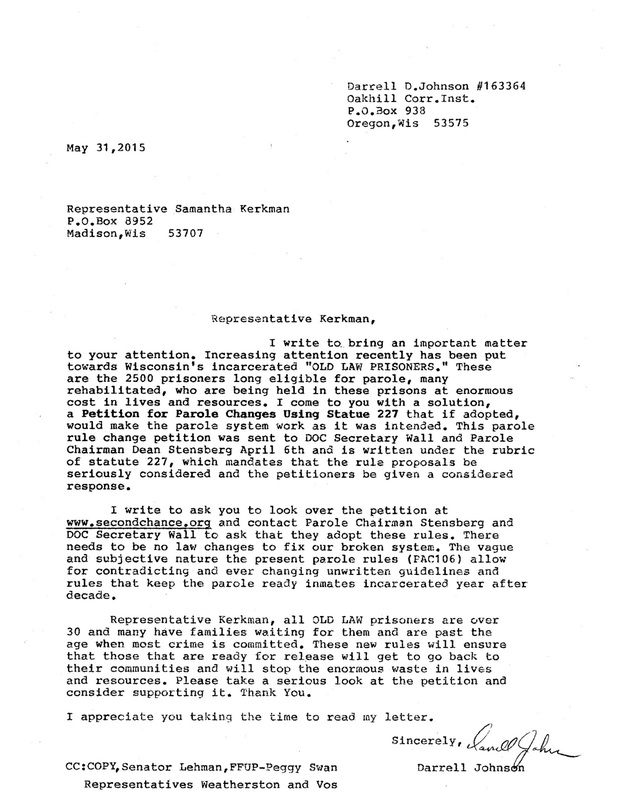 Marie Brown from BROOKLYN CENTER, MN signed this petition on Jan 23, 2016. · 3. Ifrah inshar from St paul, MN signed this petition on Jan 23, 2016. · 2. 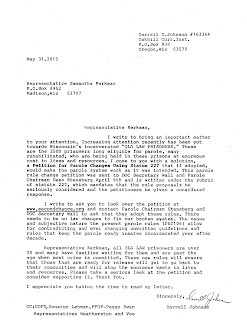 MartiniqueJohnson from Maplewood, MN signed this petition on Dec 4, 2015. · 1. FFUP from Blue River, WI signed this petition on Dec 2, 2015. Apprenticeship through the Department of Workforce Devel. 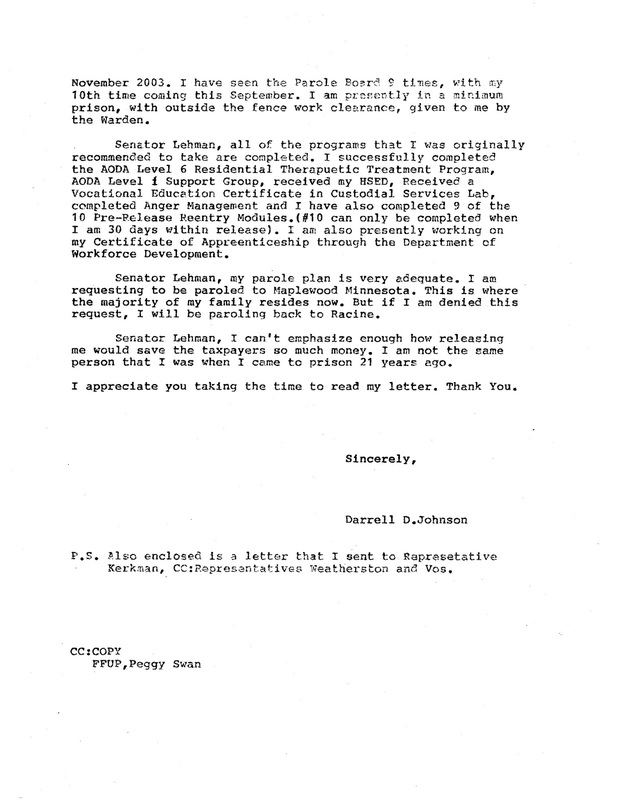 12.Official reasons for denial/deferments:"Not Served Sufficient Amount of Time." Mrs/Ms Swan, at this present time I know that I am not a risk to the any community. I have been incarcerated for 21 years for a non-violent crime. Please know that I am not minimizing my actions but at the worse time in my life I burglarized two homes. I take full responsibility for my actions and my situation. But I am not the same person today, that I was 21 years ago. Coming to prison literally saved my life. Since being in prison I have gotten the drug and alcohol treatment that I so badly needed. I have also gotten the educational help that I need to look for a job and the skills that I need to keep a job. possession of drugs/alcohol and/or disrespect to staff. In fact, I have only received 1 minor and 1 major conduct report in the last 11 years. I feel that I have served sufficient time for my punishment. I have been eligible for release for 12 years. More importantly, I am ready to be released. I am statutory eligible for release, as well. My program participation is very satisfactory. My parole plan is also very adequate. At this present time I know that I am not a risk to the public. At the worst time in my life 1 burglarized two homes. I am surely not minimizing my actions but I have done almost 22 years for a non-violent crime. I take full responsibility for my actions and my situation. But I can assure you that I am not the same person today, that I was almost 22 years ago. to apply/look for a job and the skills that I need to keep a job. I am a skilled upholsterer, a certified fork lift operator, a certified school tutor and a certified custodial worker. My plan is to start my own business in the custodial field. I also have a great number of family and friends that will assist me upon my release. My plan is to be released to the state of Minnesota and live with m, sister Martinique. noone got hurt during those two burglaries and that the victims received their property back. 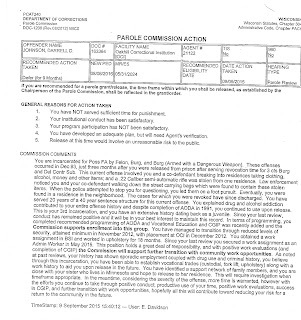 "Violent offender" VS "guilty of a violent crime"
Darrck A Alexander:Does the Parole Commission consider rehabilitation? Jose Fuentes ordered deported-why is he still here? Scott Howard- Does rehabilitation matter? to learn more about the Wisconsin parole campaign, our second chance grassroots group and other efforts to effect real change, email pgswan3@aol.com or call 608-536-3993 . 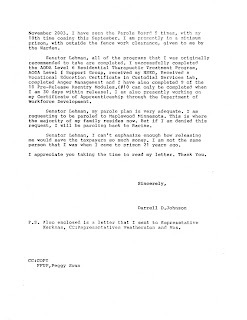 Good intro to parole fiasco: "free Ron Schilling"
SECOND CHANCE FOR THE ELDERLY PRISONER elderlyrelease.wordpress.com:discussed nationwide problem of elderly in prison-the $$expense and waste of life . Alternatives and a pathway for release. PDF studies, essays writings. PRISONWORLD VIEWS. prisonworldviews.wordpress.com Studies covering all aspects of prisoners and the prison industrial complex. Latest supreme court decision affecting plea bargaining and much more coming. JUSTICE FOR JUVENILES : kidsinprison.wordpress.com: Pdf files on recent supreme court decision banning mandatory life sentences for kids who waived into adult court; Discussed issue of kids in prison, pathways for release. SOLITARY CONFINEMENT DISCUSSED studiesonsolitary.wordpress.com- pdf studies , lawsuits, essays follows growing debate over our national overuse of solitary confinement for the mentally and otherwise difficult prisoner. This blog is a companion to our Parole web page. 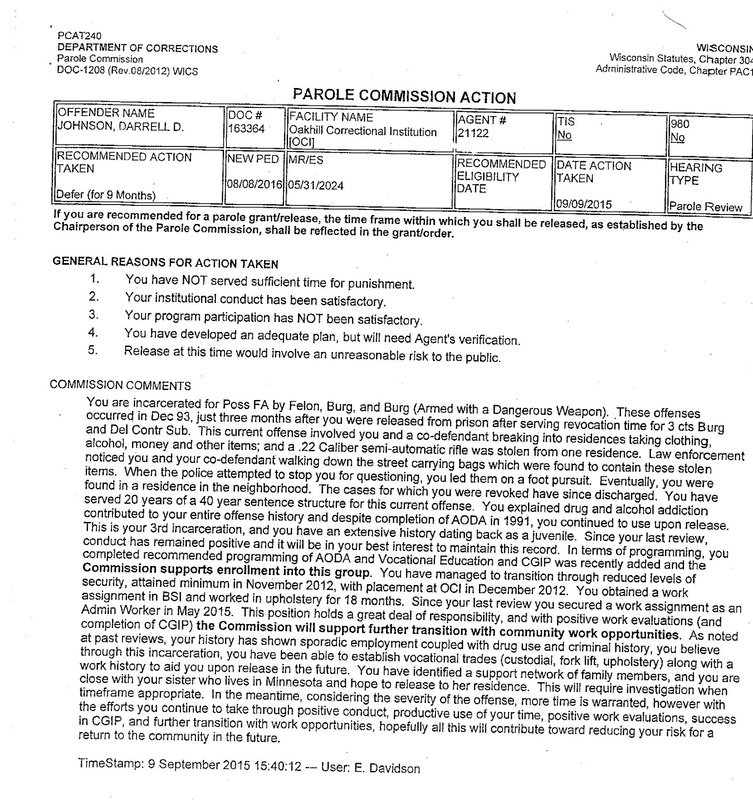 Wisconsin has 2887 prisoners who are eligible for parole but are denied year after year. We are part of a campaign to see that these people get a second chance. They are all long past their parole dates. We want to spread the message loud and clear that people DO Change. Below are some of the stories and profiles of the many people stuck in a broken and wasteful system.